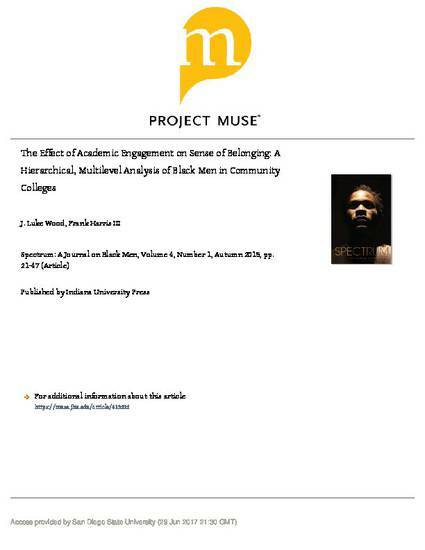 This study employed a hierarchical, multilevel modeling approach to investigate the effect of engagement on Black male community college students’ sense of belonging. Four measures of engagement were employed at level 1 and in aggregate at level 2 as predictors of belonging, including active and collaborative learning, faculty-student interaction, exposure to diversity, and usage of student services. Models illustrated that three level 1 engagement measures (e.g., faculty-student interaction, exposure to diversity, and usage of support services) were significant predictors of sense of belonging, with and without controls. Of these measures, use of support services had the greatest effect on sense of belonging. Further analyses showed that aggregate active and collaborative learning had a negative effect on sense of belonging, meaning that greater Black male engagement in academic matters and in collaborative learning experiences resulted in lower levels of sense of belonging. Implications for future research and practice are discussed.